Apparently, no-one knows who Joss Whedon is. At least, that’s the message I get whenever I wear this shirt. “But who is he?”, everyone says. “Only the writer of such hit shows and movies as Buffy, Angel, Firefly and Serenity”, say I. So, there you go. The copy I bought of this shirt I picked up from my local “Forbidden Planet” on Shaftesbury Avenue in London, so I’m not entirely sure whether it’s an official one from PvP or a knock-off from somewhere else. There’s no PvP logo on it, but it came from FP, so I’m less likely to believe it was a knock-off than if I’d picked it up from a less than reputable market stall. Anyway, there is a point to this. 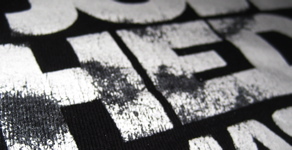 You see, after just a couple of washes, the type started to come off the print. Normally, this would be a massive problem for me, but on this tee I reckon it works quite well. Anyway, just a heads up to you chaps that might be thinking about buying one for yourself. The shirt I have is a Hayes authentic, and is nice and heavy. 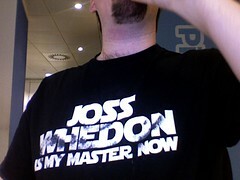 You can pick up “Joss Whedon is my Master Now” from the PvP store, and it will set you back $18.99.